Positronic’s Baby King Cobra Is Small But Tough » Electronic Salesmasters Inc. The Baby King Cobra by Positronic is a sleek and tough circular connector, with a higher performance than other connectors in its price range. 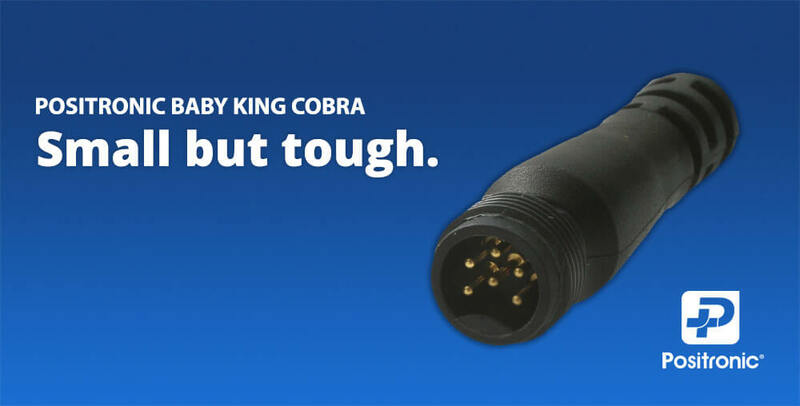 Positronic’s Baby King Cobra offers superior connector performance at a lower price. It’s a miniature form factor circular connector developed for industrial use. The BKC works as a quarter-turn connector. The BKC series is designed for be small, economical, and rugged. The connectors are available in 3 #20 contact and 6 #20 contact varieties.